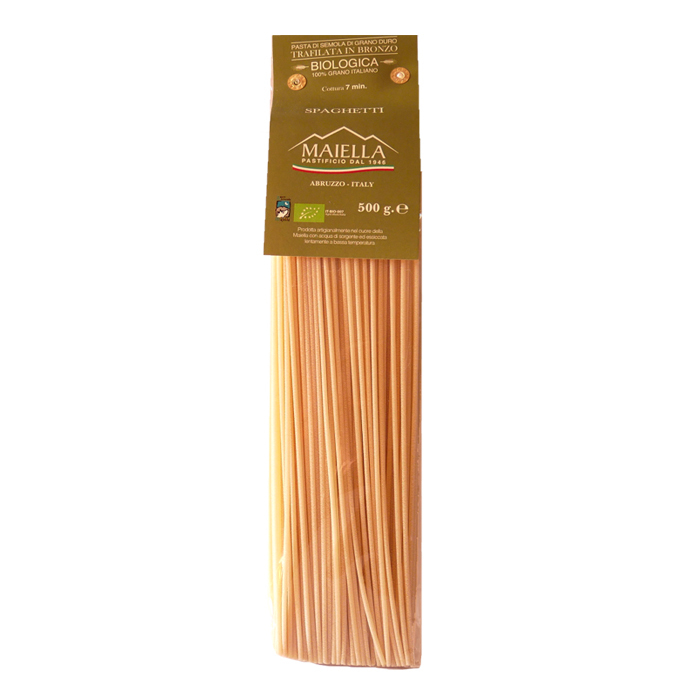 Bronze die organic spaghetti made with high quality durum wheat and pure mountain water from the Maiella natural park in Italy. The pasta is extruded through bronze dies, giving it a rough-textured surface to which sauces cling and is then slowly dried at low temperatures. This old fashioned method enables the pasta to retain more of the flavour and aroma of durum wheat and to maintain a high nutritional value. 100% fine quality organic Italian artisan pasta. Pastificio Maiella is an artisanal producer from Abruzzo, a region of Central Italy with a long tradition for pasta making. It applies its long-established skills in making a pasta dish unforgettable. This was purchased as a Christmas gift, so unable to say how good it all tastes! But it looks lovely and came securely packaged in perfect condition.